A trumpet sounds. KING HENRY VI, GLOUCESTER, and EXETER enter. Have you perused the letters from the pope,The emperor and the Earl of Armagnac? Have you read the letters from the pope, the emperor and the Earl of Armagnac? I have, my lord: and their intent is this: They humbly sue unto your excellence To have a godly peace concluded of Between the realms of England and of France. I have, my lord, and this is what they want: they ask your excellence earnestly to settle a godly peace between the countries of England and France. And are you inclined to agree with their proposal? Well, my good lord; and as the only meansTo stop effusion of our Christian bloodAnd 'stablish quietness on every side. Yes, I am, my good lord. It is the only way to stop the outpouring of our Christian blood and establish peace on both sides. Ay, marry, uncle; for I always thought It was both impious and unnatural That such immanity and bloody strife Should reign among professors of one faith. Ah yes, uncle. I have always thought that it was ungodly and unnatural that such barbarity and bloody fighting should rule people who hold the same faith. Beside, my lord, the sooner to effect And surer bind this knot of amity, The Earl of Armagnac, near knit to Charles, A man of great authority in France, Proffers his only daughter to your grace In marriage, with a large and sumptuous dowry. Also, my lord, the sooner peace is established, the stronger this friendship will be. The Earl of Armagnac is closely related to Charles, he is a man of great authority in France and offers his only daughter to your grace in marriage. She has a large and impressive dowry. Marriage, uncle! alas, my years are young! And fitter is my study and my books Than wanton dalliance with a paramour. Yet call the ambassador; and, as you please, So let them have their answers every one: I shall be well content with any choice Tends to God's glory and my country's weal. Marriage, uncle! Ah, but I am still so young! It is better that I spend my time studying and buried in books than fooling around with a lover. But call the ambassador, and have them write their answers to all the letters. I will be happy with any choice that pleases God and my country's welfare. Enter CARDINAL OF WINCHESTER in Cardinal's clothes, a Representative and two Ambassadors. What!? Is the Lord of Winchester inaugurated, and has he become a cardinal? Then I think what Henry the Fifth once predicted will come true: "If he becomes a cardinal one day, he'll make his Cardinal's hat as powerful as the crown." My lords ambassadors, your several suits Have been consider'd and debated on. And therefore are we certainly resolved To draw conditions of a friendly peace; Which by my Lord of Winchester we mean Shall be transported presently to France. My lords ambassadors, your separate requests have been considered and debated. And therefore we can say for certain that we will draw up the conditions of a friendly peace, which shall be taken to France immediately by my Lord of Winchester. 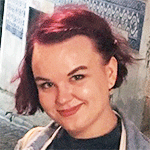 And for the proffer of my lord your master, I have inform'd his highness so at large As liking of the lady's virtuous gifts, Her beauty and the value of her dower, He doth intend she shall be England's queen. And as I was asked, I have informed his highness about the virtuous gifts of the lady, her beauty and the price of her dower and he agreed that she shall be England's queen. In argument and proof of which contract, Bear her this jewel, pledge of my affection. And so, my lord protector, see them guarded And safely brought to Dover; where inshipp'd Commit them to the fortune of the sea. As evidence of our contract bring her this jewel, as a promise of my love. And so, my lord protector, make sure they are protected and safely brought to Dover where once they have set off, leave them to be carried by the sea. All exit apart from CARDINAL OF WINCHESTER and a Representative. Stay, my lord legate: you shall first receive The sum of money which I promised Should be deliver'd to his holiness For clothing me in these grave ornaments. My lord Representative, stay. You will first get the money which I promised to be delivered to his holiness the Pope in exchange for giving me these dignified robes of office. I will do as my lord pleases. [Aside] Now Winchester will not submit, I trow, Or be inferior to the proudest peer. Humphrey of Gloucester, thou shalt well perceive That, neither in birth or for authority, The bishop will be overborne by thee: I'll either make thee stoop and bend thy knee, Or sack this country with a mutiny. [To himself] Now Winchester won't surrender, or be subordinate to the proudest lords, I am sure. Humphrey of Gloucester, you will soon realize that the bishop won't be overshadowed by you, not in birth or in authority. I'll make them walk over you and sink you to your knees, or else start a rebellion in this country. Romancikova, Nina. "Henry VI, Part 1 Translation." LitCharts. LitCharts LLC, 19 May 2017. Web. 20 Apr 2019. Romancikova, Nina. "Henry VI, Part 1 Translation." LitCharts LLC, May 19, 2017. 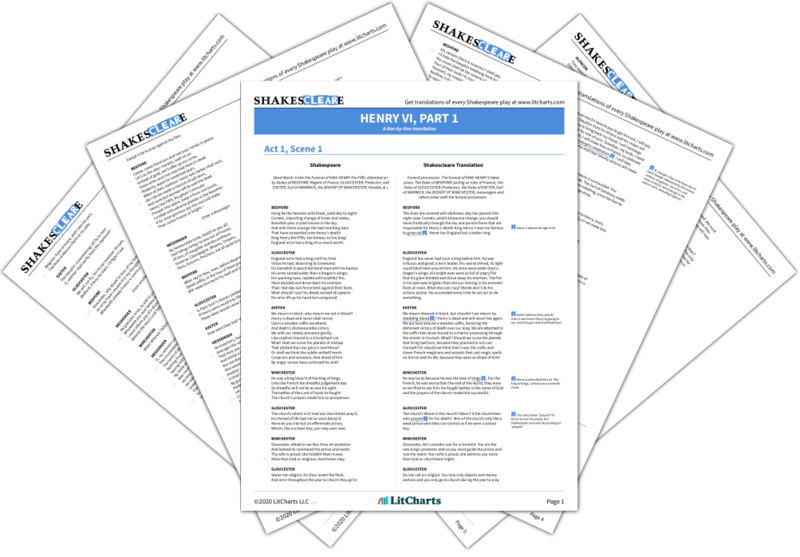 Retrieved April 20, 2019. https://www.litcharts.com/shakescleare/shakespeare-translations/henry-vi-part-1.